Not too much about book history can be considered ghastly or morbid. But as you gear up for Halloween this year, don’t disregard the rumors lurking in the stacks: Some books throughout history were bound in human flesh. Anthropodermic bibliopegy, the academic term for books bound in human skin, fascinates many students and researchers around the world. There are a handful of books living in universities, museums, and private collections across the globe with these rumors attached, and to the excitement of some — and the horror of others — several have been scientifically proven true: they are indeed bound in the flesh of humans. Many questions arise when one is told a book they’re holding is bound in human flesh. Who created these books and why did they choose such a material? Who was the willing (or unwilling) donor? What kind of text has been fated to wear a shroud of human skin for the rest of its days? And lastly: Do I want to put this book down or dive into its curious past? Throughout the middle ages and popularized more in the 1800s, books have been bound in human skin for a variety of reasons. In tales that can rival the best works of horror, mystery, and crime, the owners of these skins include medical patients, secret admirers, criminals, enemies, and more. Whether from the behest of the donor before death or at the strange obsession of a doctor or even at the bidding of the law — several of these tomes have survived the test of time. Proteomics Resource Laboratory, and Dr. Daniel Kirby of the Straus Center for Conservation and Technical Studies confirmed with 99% surety that the binding came from a human. With this inscription, we are left wondering who this woman was and why history remembers her skin but not her name; however, we are also given quite a poetic motive for its binding. Several other rumored bindings in Harvard’s collections were tested as well, yet proven to be bound in sheepskin. Continue reading here for more information on the scientific testing of Des Destinees de l’Ame. The Historical Medical Library (HML), located within the Mütter Museum in Philadelphia, proclaims to house the largest collection of confirmed anthropodermic bindings in the United States. In March of 2015, the HML invited Dr. Richard Hark of Juniata College to take samples of their five rumored anthropodermic books and Dr. Daniel Kirby confirmed that they are, in fact, bound in human skin. Through inscriptions and historical documentation, we know that three of the five books share a mysterious past: all bound at the hands of Dr. John Stockton Hough, and all bound in the skin Mary Lynch, a tuberculosis patient at the Philadelphia General Hospital, who died in 1869. Evidently, Dr. Stockton Hough collected a sample of Mary’s skin before her burial in 1869 and kept it for several decades before binding these books in the 1880s. We may never know his motives for doing so. The books themselves? Historical texts on female health and reproduction. To read more of Mary’s story, visit the blog of the Historical Medical Library. How does one determine if a book is truly bound in human skin or if it is actually a more common leather taken from sheep, goat, cow, or pig? Des Destinees de l’Ame and the Stockton Hough Collection were scientifically tested using the same method: through a process called Peptide Mass Fingerprinting (PMF). PMF uses very minute samples from the book’s binding and tests for specific amino acid sequencing, comparing the results to what is known to occur in various mammals. 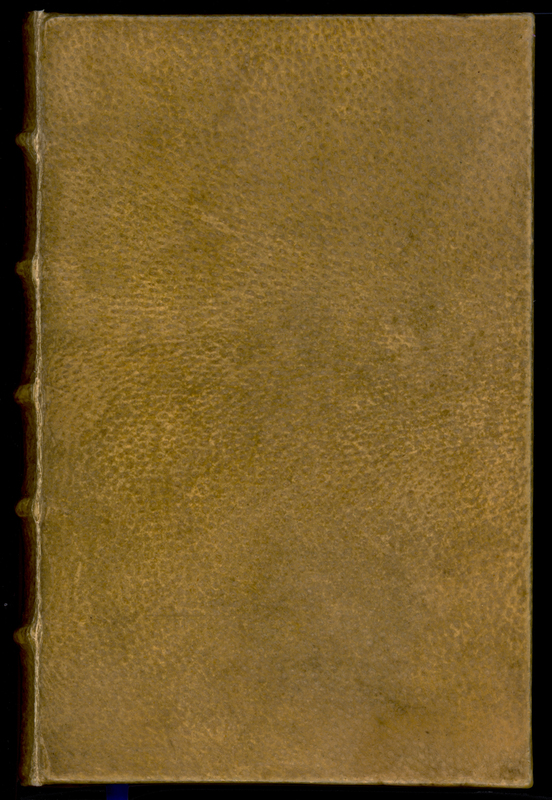 The Anthropodermic Book Project has made it its goal to investigate claims of human skin bookbindings. So far, they have tested 30 books claimed to be bound in human skin using the Peptide Mass Fingerprinting method, with 18 positive results and 12 books determined to be fakes. No published lists of results exists, as many institutions wish to remain private on the status of their materials. For a complete description of Peptide Mass Fingerprinting, including a comparison to DNA analysis, visit: Analyzing Alleged Human Skin Books Via Peptide Mass Fingerprinting. In 2014, anthropodermic bibliopegy became popular in the media after Harvard declared that one of their rumored books was actually bound with sheepskin, rather than human flesh. We can be grateful for this resurgence in interest, lest many bibliophiles or fans of the macabre would have never known about this eerie past lurking in the archives of the world. ABM Guest Blogger Sherry Lochhaas is a librarian by trade and enjoys exploring the odd & fantastical side of life. She lives in Oakland, California.